Anyone who has had chicken pox can get shingles. After the chicken pox clears, the virus stays inside the body. 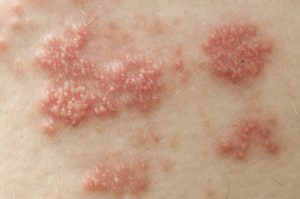 If the virus awakens, or reactivates, the result is Shingles. Shingles presents as a painful rash with a telltale cluster of blisters. The rash may be “announced” by a small area of the skin on one side of the body that feels burning, itching or tingling for one to three days, either constantly or on and off. A rash follows in the same area. The rash then turns into groups of clear blisters, which turn yellow or bloody before they crust over (scab) and heal. The blisters typically last two to three weeks. The patient may have flu-like symptoms and a fever and often the blisters are accompanied by pain. The risk of getting shingles increases with age. Some people have nerve pain even after shingles is gone, and this pain may even trouble some people for years after their bout of shingles. Antiviral medication may help prevent this type of nerve pain if taken within three days of the blisters’ forming. There is currently an FDA-approved anti-shingles vaccine to prevent shingles, which is said to also decrease the tendency of having ongoing nerve pain after shingles. Our office can effectively diagnose and treat shingles. Please consult our practitioners if you think you may have shingles.